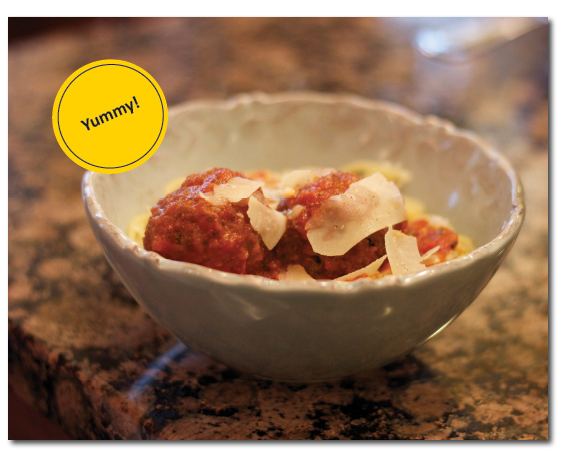 The Quest for Great Meatballs | Home Cooks Unite! It’s no secret that I love meatballs. Growing up in New Jersey, just about every large gathering was catered by an Italian restaurant and featured all types of pastas and proteins. Swim team banquets, first communions, funerals – you name it, there was probably a steaming chafing dish of meatballs there and me cutting in line to get them. Eric is my friend Dianne’s husband (see: Come Together, Right Now, Over Ziti. Another post with meatballs, by the way. A coincidence? I think not!). He’s also the family cook. 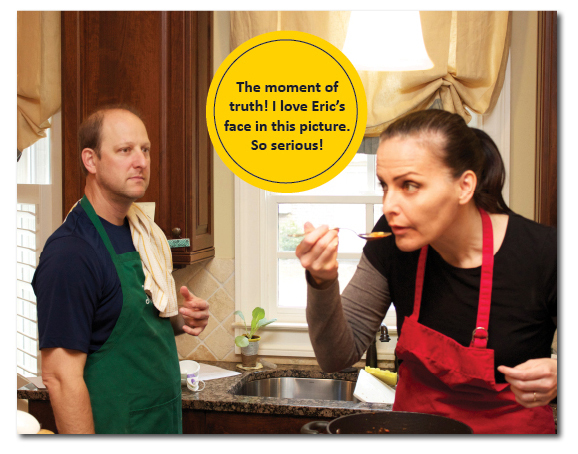 What I love about Eric is that he has a very demanding job, but when he comes home, he relieves his stress by making a meal for his family. On more than one occasion, he and other members of his family have told me that he makes the best meatballs. 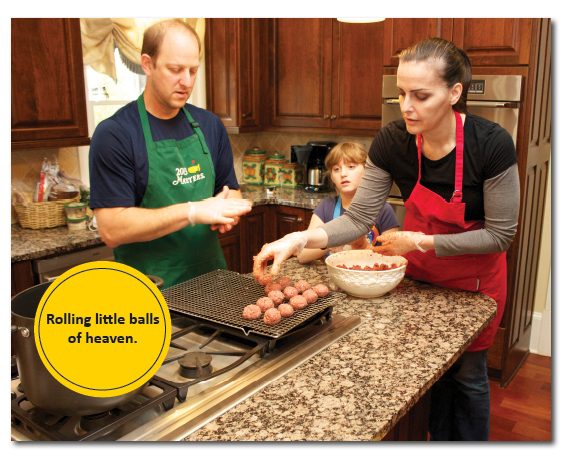 Always eager to learn a tip or two about making these little balls of heaven, I asked him to cook them for me. When I arrived at their home, Eric and his daughter Sidney were already suited up. 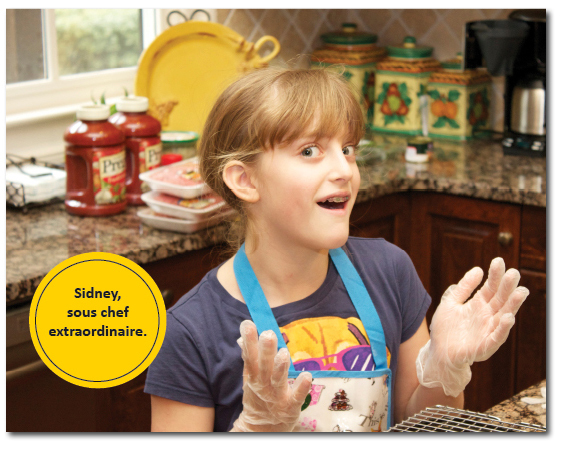 Sidney’s apron was particularly cute. “I got it from my grandma for Chanukah.” There were fresh herbs and cheese on the counter. “Fresh is best,” Eric commented. 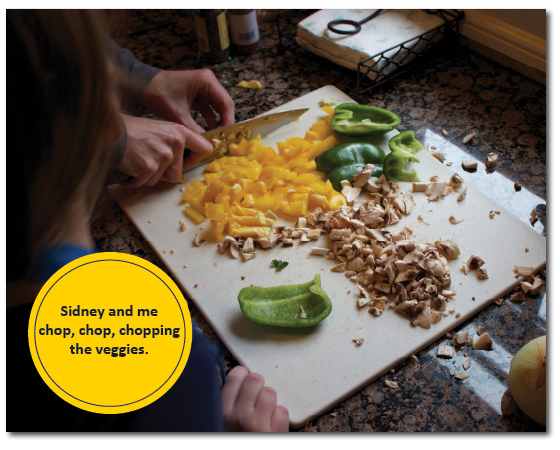 Sidney and I started chopping the veggies while Eric chopped the herbs. We were off to a good start. 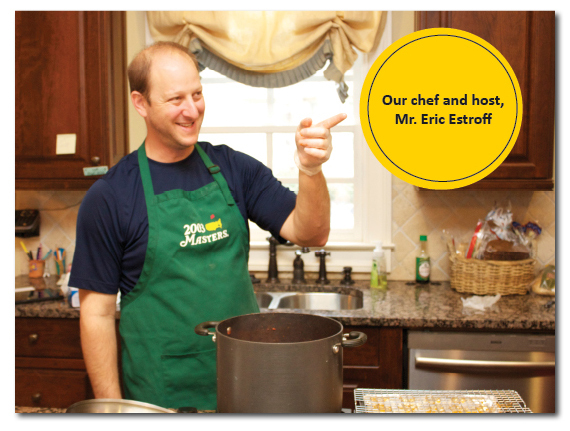 I asked Eric, why meatballs? 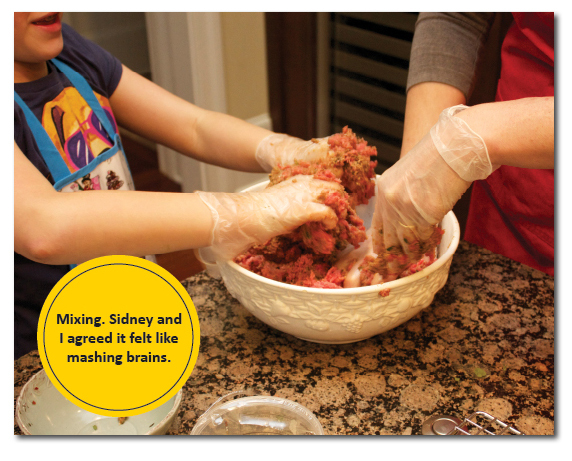 What was it that made you want to make a great meatball? Turns out, he and Dianne had dinner several years ago at his boss Mark’s house. Mark’s father is German and his mother is Japanese and they were both great cooks. He became a great cook, too, and incorporated their cultural nuances into his own food. Mark served meatballs that evening. One bite, and Eric knew these were not your average meatballs. Mark was kind enough to share the recipe, and Eric was off to the races. The first time he made them, Eric thought they weren’t as good as Mark’s. So he enlisted his children (Shelby, Noah and Sidney) as sous chefs, and they tinkered with the recipe on and off for five years, adding a little of this, taking away a little of that. That’s something I love about Eric’s cooking style. He is completely intuitive. 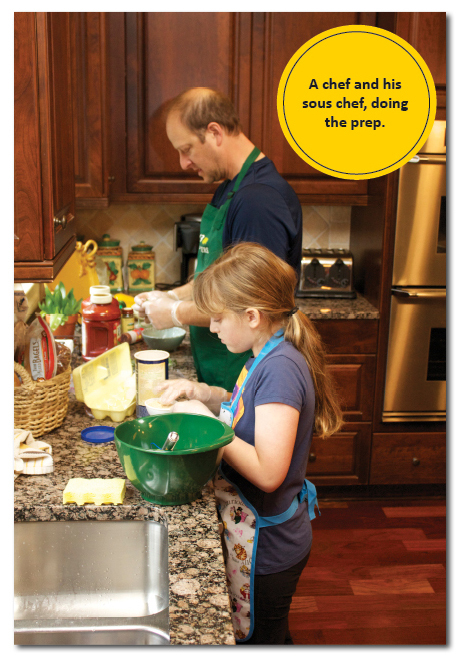 He cooks from the heart and incorporates his family’s likes and wants instead of following a recipe. Each meal is uniquely their own. There is no doubt these are Estroff meatballs and they can’t be found anywhere else. Let the meatballs sit overnight in the sauce so the sauce infuses into every bite. 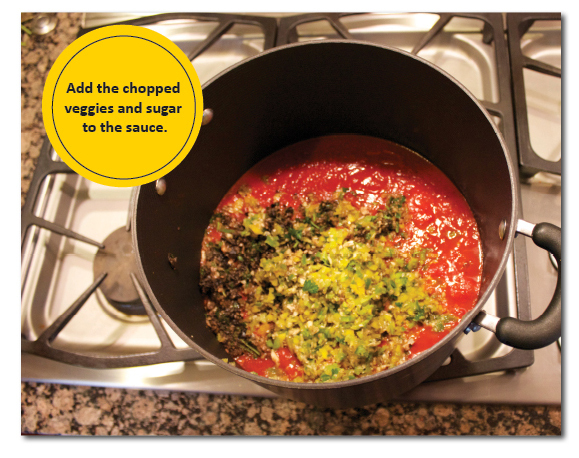 You can make your own sauce (which he’s done before), but a doctored up Prego or Barilla works well in a pinch. Meatballs are best enjoyed with some angel hair pasta, a caesar salad, a little garlic bread and a good glass of wine. Cook with lots of love and don’t be afraid to break the rules and try something new! I had originally considered doing this post as a throw down of sorts. My meatballs versus Eric’s. Boy, am I glad I didn’t. These were delicious! The wine added an unexpected tanginess that was complemented perfectly by the sweetness of the sauce. They were delicious. The best part was hearing his family talk about how much they loved when Eric cooked them. 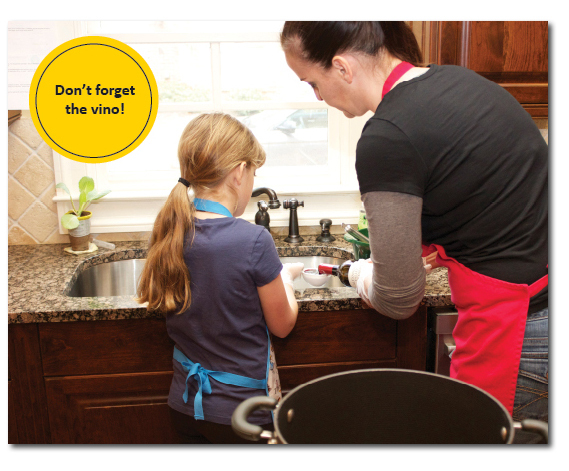 It’s a recipe they clearly enjoy together, and I was so happy to share it with them! Thanks Estroffs! Per Eric, all measurements are approximate, as this is food of love. Gently mix ingredients by hand. Don’t over mix. 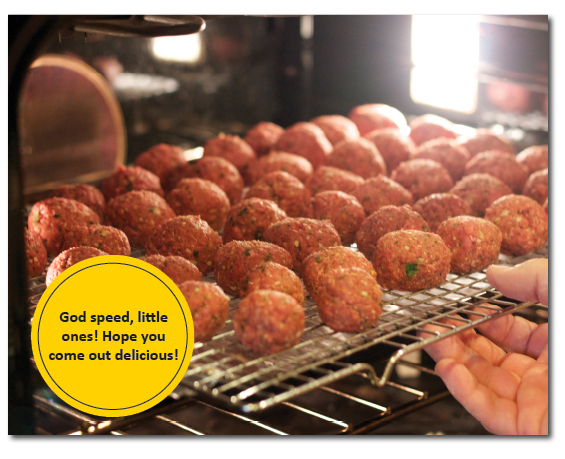 Pat into golf ball sized meatballs. Bake at 350 degrees for approximately 30 minutes on a wire rack so that grease drips off. Be sure the sauce is warm when the meatballs are done. Immediately place the meatballs in the sauce, as they will soak up some of the sauce naturally coming out of the oven. Simmer over low heat for about another 45 minutes to an hour. For optimal flavor, cool and refrigerate overnight. Reheat the next day and enjoy! I love meatballs! 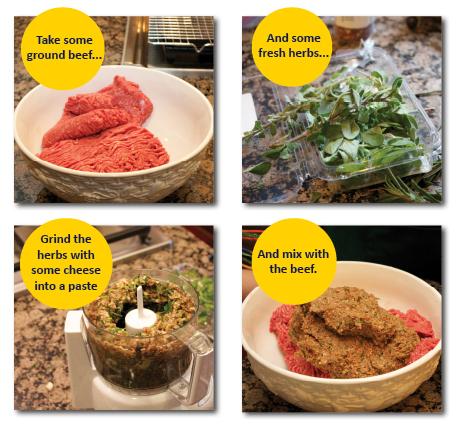 So – the herbs and cheese goes into the food processor? Food process all but the meat and then mix together with the meat? Like mixing the brains? Inquiring minds have to know! 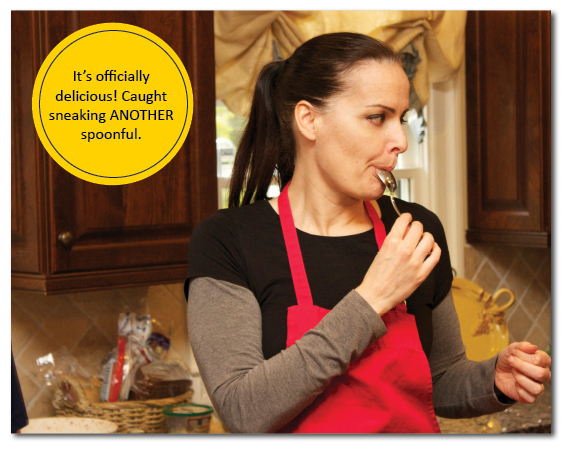 And you should taste them the next day…and the next! heaven just gets better and better! Those meatballs look absolutely scrumptious, i love meatballs!! If only I could reach into my computer screen and steal some..